David White is the co-founder of Active Train, a rail replacement service for walk and run commuters. A keen runner and coach living and working in London, he understands the need to incorporate exercise into one's daily routine. 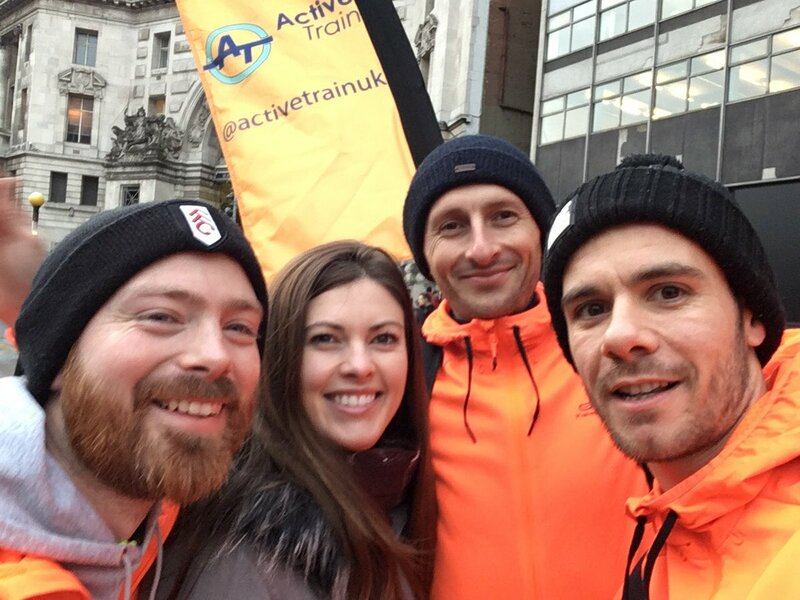 We spoke about how Active Train can help people of all levels of fitness get fit and avoid delays in a friendly, social setting. rb: What's Active Train all about? dw: I'd describe it as a rail replacement service for people who want to get more active. 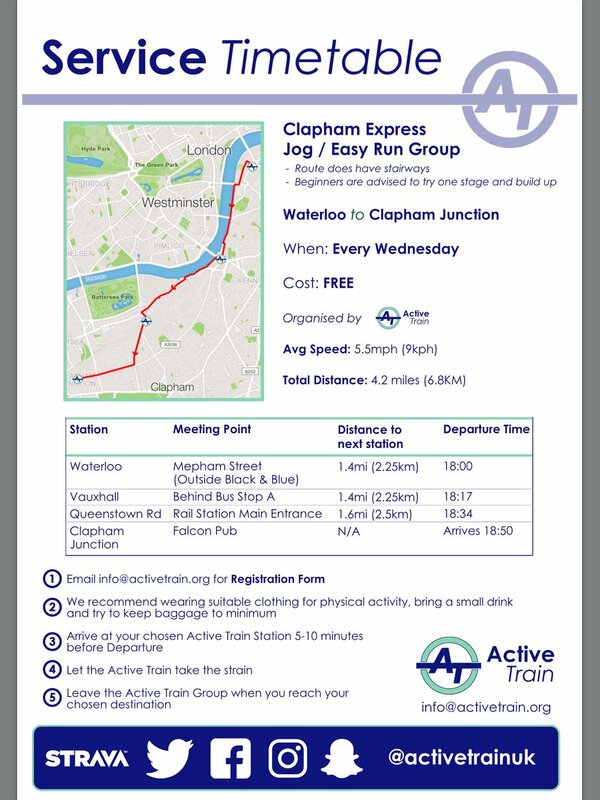 We offer free, volunteer-led community walking and running groups as an alternative to the tube or train. We look at busy commuting areas and basically get people between major transport hubs. rb: Sounds great. Where exactly do you do the runs? dw: We're very new so at the moment we're just in Lambeth. We were trialling it through December  with pilot sessions thanks to funding from London Sport and we're just a few weeks into the real sessions now. 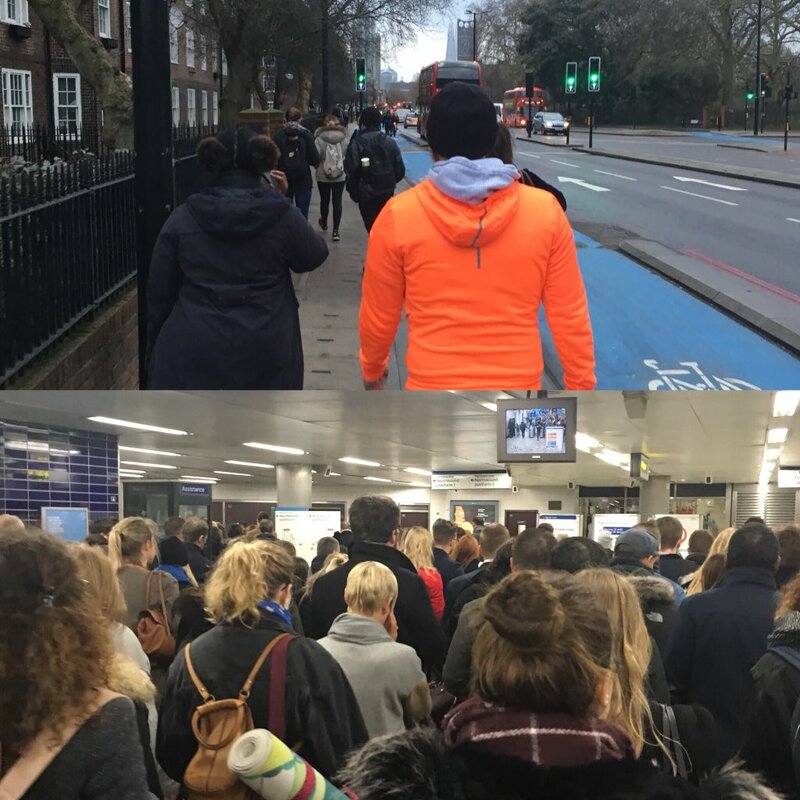 At the moment on Wednesday mornings we have a walking group called The Lambeth Line that follows the Northern Line from Stockwell up to London Waterloo. Then in the evening we meet at London Waterloo and run to Clapham Junction via Vauxhall and Queenstown Road. rb: Are you trying to target commuters specifically? And both runners and walkers? dw: Commuters are our core market. In terms of fitness levels, we like to think there's something for everyone. We have the walking group and there's definitely a couch to 5k element there. You can say, OK, get yourself to Oval and we'll walk with you to Kennington. That's one tube stop, 800 metres, which'll add just 10 minutes to your journey. Next week we'll walk you to Kennington (the next stop), and so on, and before you know it you're walking the whole thing. For a newer runner we might say, meet us at London Waterloo and we'll run to Vauxhall. It doesn't matter how fast or slow you are, we run as a group and nobody ever gets left behind. Then they might look to extending that to another stop a few weeks later. You can progress at your own rate. But we're also suitable for the regular runners, those who might run five or six days a week. They can use it as an easy run without carried away because they're restricted by the speed of the first person. You might think, I've got a session on Tuesday and Thursday, so maybe I'll get in an easy-paced run on Wednesday. rb: So, there is no requirement for people to do the whole run? psh: No. You can get on and off the train when you like. You might just want to join us for the 800 metres between Oval and Kennington, or tag along for the whole ride. It's up to how you feel on the day. We offer service timetables with departure times for each station. So, all you have to do is get to your “stop” five minutes or so before departure time, then can get on the train when it comes along. Exactly the same as if you're getting the tube or the train. We're very easy to spot with our bright orange hoodies, or bright orange t-shirts in the summer, and the train driver is carrying a big Active Train flag. You can't miss us. rb: And that timetable is designed to fit in with the habits of most commuters? dw: Some of the feedback we've had so far is along the lines of, "Oh, I don't get the Northern Line to work, so the project isn't for me". So, we say, OK, if you leave a little bit earlier you can plan your journey around it the same way you plan your journey with the TFL planner. Use ActiveTrain in a similar way. You don't have to be a Lambeth resident living on the doorstep to get involved. It's also about lifestyle. You don't necessarily want to get home from work after a long day and go out and exercise again. With us, your commute might take a little longer, but you're getting your daily quota of exercise in at the same time. What I hope comes across to people is that there is no need for commitment, either in terms of joining us regularly or doing the whole walk or run. They shouldn't feel daunted by it. It's free so you can duck in and out as you like. It's not like on a club run where you might be half way out, exhausted, but you still have to get back to the clubhouse to pick up your kit and so on. This is part of your commute. So, if you're not feeling great all you need to do is get to the next station. And we're not going to leave you behind. Someone will stay with you until you get back on the train. rb: Do you think people are keen to get away from the standard commute with its delays and other problems? I hope so. I think the general feeling towards companies like Southern Rail that we've seen recently isn't great. We're not trying to pour fuel on the fire, but just point out that there's an alternative. In fact, there was this great tweet Hugh did where we went into Waterloo station and took a photo of the concourse, and people were just piled everywhere and overflowing through the doors. Then we compared that to a photo of a group of us out on a run on a nice crisp December evening. Why would you pay the prices you're paying and endure that when we can get you to the next stop for nothing? rb: Who leads the runs? 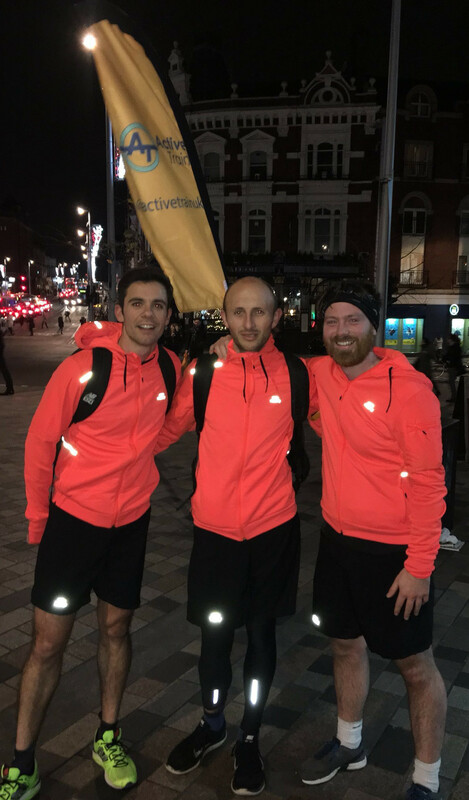 dw: Me and my colleague Kieran Crombie are co-founders and we have a volunteer leader called Hugh who's a CiRF (Coach in Running Fitness). We also use a couple of CiRFs from London City Athletics Club. Tonight, for example, the session's being run by their chairman Andy Melrose. The idea is that we'll have one CiRF or LiRF (Leader in Running Fitness) who is supported by volunteers who are first aid trained. In terms of organisation, you have the train driver. They set the pace and run at the front with a big flag. That person will be a qualified run leader. Then there's the train guard. They stay at the back and have a backpack with first aid kit and other bits. At the moment that's also a run leader, but it doesn't necessarily have to be. At minimum it'll be a first aid trained member of staff. In terms of safety, the routes are fully risk assessed. We know what's available at the train stations we pass. That's the beauty of using these routes: there are loads of facilities available at the train stations if we need them. We're never far from lots of resources. rb: So, you've got people leading the runs who know what they're talking about? dw: Yeah, we've all got a background in running: both competing and for fun. So, there is a strong knowledge base there for people who want to come along and learn a bit. Although strangely we tend not to talk much about running while actually out there. We talk about days at work, what's for dinner and so on. It's nice to let off steam at the end of the day. dw: I'll admit I've not engaged massively with group runs in the past. I tend to do most of my running on my own. But what I've enjoyed about doing this is you have a kind of carousel. You might have ten people around you in a group and you're chatting to one person, then another will come up beside you and join in, then they drift off and chat to someone else. It's not like you're stuck in a corner at a party. It's a very free-flowing, organic environment. rb: At the moment the walks and runs are on a Wednesday. As you expand will you add extra days? dw: We've done a lot of research on what fitness classes tend to do and certainly Tuesday is a big night. Thursdays also tend to be a big training night, and of course they're social nights as well. If you look at traditional athletics Wednesday tends to be easy run night, so it fits in well with that. One of the inspirations behind this was talking to people in my office at my day job. They do parkrun on Saturdays and find it hard to do any other exercise throughout the week. So, they turn up to parkrun on a Saturday and blitz 5k. They feel a bit frustrated that they can't beat their PB, and it's because they don't get time to train. So, this is almost a tailored easy run in the week, just to offer that little bit of extra cardio in the week. There's nothing competitive about it. Wednesday fits nicely at the moment. We won't say we're not going to expand to other days of the week, but I think it'd look nice if first we could offer a full program across London on one night a week. What'd be lovely is to do the whole tube map. It's run by volunteers, so it doesn't need to be at fixed times every week. rb: Are you open to people setting up their own runs? dw: We're looking for groups that'll take this forward for us. If you want one in your area, then get in touch with us and discuss it. We're looking at ways of funding qualifications, helping with risk assessment and kit and so on. And it just helps us build up the network active train across London. rb: How do people get involved? dw: You can register on our web site. You can also find us on facebook ,Twitter or Instagram. Or if you prefer email us at info@activetrain.org and request a simple registration form that you can just email back to us. rb: It all sounds amazing and I can't wait to give it a go personally next time I'm in town. Just one more question that we ask all our interviewees: if you could race against any athlete from any era in any race and get any outcome you want. Who, when, where and what would it be? dw: I think it would be the 2012 Olympics 10,000m final against Mo Farah. I would front run the race at world record pace and try and drag Mo out of his comfort zone. Whether he beats me or not would be the ultimate measure of what a great sportsman he's been. I've always wanted to know what would happen if someone like Kenenisa Bekele took him out of his comfort zone. rb: So, it's a world record whoever wins? dw: Yep, it's just about whether or not he's got the sprint finish to go past me at the end or not. rb: Can we press you for a clear winner? dw: I'm very competitive so I think I'd have to win. rb: See the results of the Farah/White battle..